"Since their musical masterpiece The End Is Not The End first came out I have been continually captivated by the stories HoH tell with their music, both lyrically and instrumentally. Between their ever-changing brand of rock, Tim Skipper's gorgeous vocals, cleverly crafted lyrics, and a dash of silliness these guys have all the right ingredients to hold the top spot on my list for years." Favorite Songs: "Code Name: Raven," "In The Valley of the Dying Sun," "Choose Your Blade"
"I became a Needtobreathe fan when I first heard The Heat in 2007. Each CD I've bought from them since then has been worth its weight in silver (gold is too expensive at over $1,000 an ounce). Their consistency in releasing high quality content and their astonishing live show cements their status as one of my favorite bands." 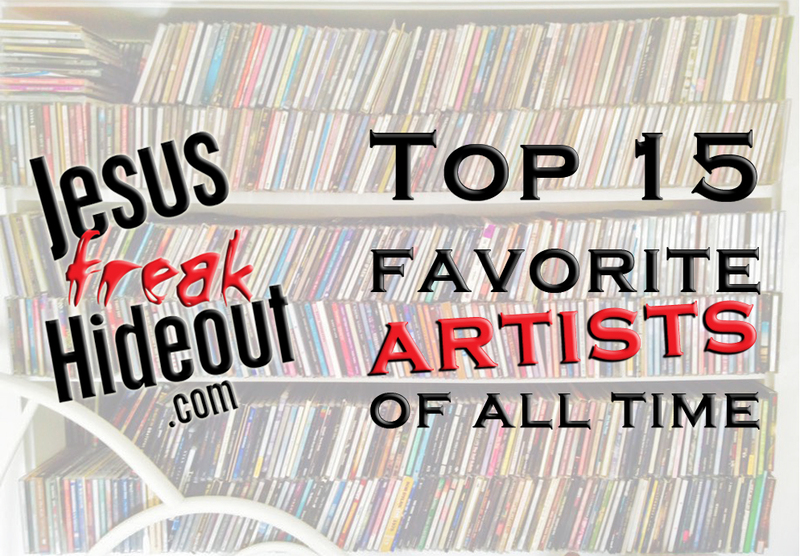 Favorite Songs: "The Outsiders," "Won't Turn Back," "Wasteland"
"Disciple's heavy hitting Christ-centered lyrics have been challenging and encouraging me in my faith for many years. Kevin Young's vocals are always drenched with emotion—regularly sending chills down my spine whether he is delivering a throat-wrenching scream on "Scars Remain" or stretching voice on "Lay My Burdens." Favorite Songs: "God of Elijah," "Purpose to Melody," "All We Have Is Now," "The Name"
"I somehow missed Albatross when it first came out, but these guys caught my attention with The Silver Chord. When Matt MacDonald unleashes his majestic vocals paired with his poignantly poetic lyrics, something truly magical happens." Favorite Songs: "Salt In The Snow," "We All Look Elsewhere (Revisited)," "The Precipice"
"Maybe I'm still holding onto some nostalgia from throwing up my rawkfist, but I'm continually impressed by these guys (save Oxygen:Inhale). Like Disciple, TFK has been a staple for me since I became a Christian at the age of 14. I often associate their music with a couple important memories in my life from getting pumped running through the dessert in Arizona, my friend dislocating his shoulder in a mosh pit while they were performing "Move" and singing my wife to sleep with "My Home." Favorite Songs: "E For Extinction," "Phenomenon," "So Far Gone"
"My first experience of DC Talk was after they broke up. In a way, I'm glad this is was case because like a good TV show that gets cancelled before it has the chance to wrap up, it's easier to watch the whole series knowing it has an unfinished ending than to experience the heartbreak in the moment." Favorite Songs:"Will Power," "What If I Stumble," "So Help Me God"
"I've only ever had two artists I've ever claimed as my favorite: House of Heroes and Sanctus Real. I considered Sanctus Real my favorite band until about 2010 when Suburba and Pieces of a Real Heart came out, the combination of which effectively switched them as favorites. They had a stellar run at the top spot and still hold a dear place in my heart." Favorite Songs: "Alone," "I'm Not Alright," "The Face of Love"
"The only rapper to make my rock-heavy list. He's a game changer for the CHH community, spitting heavy-hitting truth over fresh beats. Whether he is rapping about theological matters or social issues, he always has something significant to say." Favorite Songs: "Fear," "Don't Waste Your Life," "Boasting"
"Fun, creative worship music. Few worship albums have been as expertely crafted and thought out as Church Music and A Collision. They've got songs for corporate worship, personal worship, and dancing. What more do you need?" Favorite Songs: "Eastern Hymn," "Wholly Yours," "O Praise Him"
"The band I come to when I just need some hard rock with a good dose of screaming. They can be fairly cryptic at times, but Andrew Schwab always has something interesting to say. And I really appreciate his passion." Favorite Songs: "The Spy Hunter," "Oblivion," "A Shadow On Me," "Above the Dessert Sea"
"Broken Voice was my first introduction to My Epic and no other musical project has had as significant of an impact on my faith than that 8 song album. Their lyrics are stunningly beautiful and I'm not ashamed to say I've cried listening to their music." Favorite Songs: "Hail," "Alone," "Lazarus"
"These guys have only been making music for a couple years and only have two projects to their name, but they quickly made their way into my heart this year with their amazing storytelling and unique singer/songwriter style." Favorite Songs: "Train Station," "Stole My Fame: (To Grace)," "Jack and Jill, pt. 2"
"I love mysterious bands like Secret & Whisper and Falling Up but they didn't end up in my top 15 because it's ultimately hard to relate to the vast majority of their lyrics. Paper Route is one of the few relatively mysterious bands that are also somehow relevant to real life. And they put on one amazing live show." Favorite Songs: "You and I," "Enemy Among Us," "Two Hearts," "Glass Heart Hymn"
"The second shortest discography on my list with only two albums and an independent EP under their belt. These guys have seemingly gone off the grid but I'm still holding out for another album from these talented rockers." Favorite Songs: "Day's End," "Hearts and Minds," "Instincts," "No One Else"
"The original Audio Adrenaline is a CCM staple. They knew how to have fun, point everything to Jesus, and challenge you to live out your faith. Audio A 2.0 was something I reluctantly got on board with but I'm not a fan of the new incarnation of the band." Favorite Songs: "Dirty," "Mighty Good Leader," "Get Down"